Westchester County leaders, in a perfect display of the Stockholm Syndrome, are asking Andrew Cuomo for help in dealing with a ConEd moratorium he caused. The Stockholm Syndrome is what happens when hostages develop irrational psychological sympathies with their captors as survival strategy during captivity. This term came into use after four hostages taken during a 1973 bank robbery in Stockholm, Sweden, defended their captors upon release. We may have another instance of it in Westchester County, New York where ConEd, the local gas provider, has had to impose a moratorium on new gas connections as a direct consequence of Andrew Cuomo delaying pipeline approvals that would bring new gas to the region. Who are Westchester leaders looking to for help? None other than Andrew Cuomo! 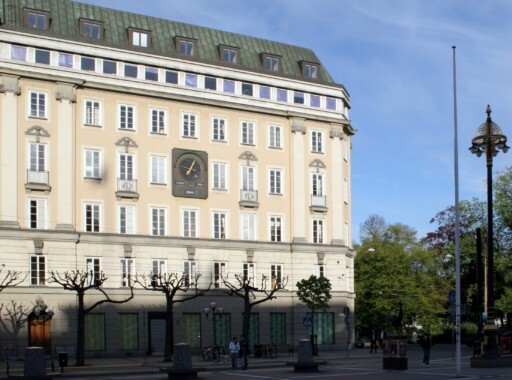 The building in Stockholm, Sweden where the robbery that inspired the term “Stockholm Syndrome” took place. The Stockholm Syndrome is no joke. It’s happened many times, perhaps the most famous instance being that of Patty Hearst. She was held in captivity by Symbionese Liberation Army captors who hauled her around the country from one hideout after another (including one in South Canaan, Pennsylvania and another in Youngsville, New York). She even helped the SLA rob banks and spent time in jail for it. Now, we’re seeing the same sort of thing in New York State. Governor Andrew Cuomo has made it a centerpiece of what seems to be a future Presidential campaign to be greener than the Green Parrot. He is, for the record at least, opposed to any sort of natural gas development; fracking, natural gas fueled power plants or pipelines. He has tried to kill numerous pipelines, in fact, including the Constitution Pipeline, which would connect with the Iroquois Gas Pipeline and thereby deliver gas to New York City and environs, including Westchester County. Cuomo has, in opposing this and other pipelines, made it point to pander to the NRDC gang, its Catskill Mountainkeeper subsidiary and anti-gas groups such as “Stop the Pipeline.” He has blatantly called for New York to get of gas, effectively holding new gas-related projects hostage as long as possible for the purpose of gaining green street cred, although it’s my opinion he has probably hoped all along FERC or the courts would overrule and give him gas after earning plaudits for opposing it. It’s a uniquely Cuomo style of crime. It’s not worked out so well, though. FERC has been reluctant to take up the cudgel against him and the courts, although they’re getting there, have been excruciatingly slow in coming to the rescue, the Constitution Pipeline having lost several court cases to date, although it has good prospects at the DC Court of Appeals. These delays in throwing back the bones Cuomo through to the NRDC gang have now caused havoc. ConEd was forced to impose a moratorium on new gas connections in Westchester County. The leaders ask the Governor to expedite Public Service Commission approval of a proposal from Con Edison called “Smart Solutions for Natural Gas” and to create incentives for the use of clean energy sources. They also ask for the Governor to intervene in clearing the way for a new gas pipeline to bring more natural gas to Westchester. The complete letter is shown below. No need to assess blame? Really, Amy? When Andrew Cuomo’s PSC lies and says they’re unaware of pipeline solutions, you don’t know who to blame? And, you want us to believe the problem is a lack of green incentives when New York State electric rates already include outrageous direct and indirect subsidies to renewables? Give us a break! You know exactly what the problem is and its name is Andrew Cuomo, who has been selling out Westchester to appease the NRDC gang and its ilk. As representatives of the New Yorkers who live and work in Westchester County, we are writing to ask for your assistance, your leadership, and your outside-the-box creative thinking in dealing with the newly-announced temporary moratorium for new natural gas services in our area. As you know, on January 17, Con Edison formally announced to the Public Service Commission and to the general public that it would be instituting a temporary moratorium in most of its Westchester County service area for new natural gas services, including residential, commercial, or mixed-use buildings currently in development that will increase peak winter demand. The moratorium is scheduled to begin on March 15 – less than two months after it was announced – and would last for an indeterminate period of time. The only stated exceptions to the moratorium would be for new customers applying for interruptible service, gas service for emergency generators that only activate in the case of an electric outage, or other service patterns that would not be likely to impact gas delivery during peak winter usage. We do not need to tell you that the news has sent a chill throughout the development community. Given the number of projects already advancing in our cities, towns, and villages, from major redevelopment in cities like New Rochelle, Rye, White Plains, and Yonkers, to the smaller residential, commercial, mixed-use, and school construction projects taking place throughout the county, we are deeply concerned about the potential economic headwinds coming from such a resource crunch. Those headwinds, on top of several other factors, could prove painful for our constituents and for the local economy. That could in turn have a ripple effect in terms of home prices and property values that further depress local economic development. We were gratified to see the Public Service Commission take this issue so seriously and schedule public hearings in our region during the week of February 11. However, we believe that more creative and pro- active management is required to provide assurance that our region can effectively weather the major impact that this may have on our overall economy. All of us support the state’s transition to sustainable, renewable, and green energy sources as critical to reducing our reliance on fossil fuels, bending the dangerous trend lines of increased carbon emissions, and racing against the clock to fight the threats posed by climate change. Part of that effort has to include the successful promotion of clean energy alternatives that will have the added benefit of avoiding the negative impact natural gas moratorium on specific projects. We understand that Con Edison has submitted a number of proposals under the name “Smart Solutions for Natural Gas Customers.” These proposals for increasing the use of geothermal heating and air source heating pump solutions are pending review by the Public Service Commission. We urge that those proposals be placed on an expedited schedule so that they may be available to both new development and existing oil customers who are looking to convert to natural gas or some other method as soon as is practical. Both the “Smart Solutions” proposals submitted by Con Edison and the programs of the New York State Energy Research and Development Authority create incentives to increase usage of clean energy sources. However, we understand that the cost differential between traditional natural gas and these new cleaner sources of energy is still too steep in many cases. We would urge the executive agencies to proactively and creatively establish new incentive programs to decrease this gap and make it more economically viable for new development and those converting from oil heat to choose smarter, cleaner, and greener options, and that Westchester County be given first priority for any pilot projects stemming from these efforts. Clearly the underlying conditions involve an increased demand for natural gas, and the constraints of the current infrastructure are insufficient to supply that demand. The main conveyance for natural gas is through interstate or intrastate pipelines, but we live in a challenging regulatory and political environment for the construction of new pipelines for fossil fuels. There are often many legitimate objections raised by local communities and environmental advocates. Although a traditional response to the basic economics of supply and demand would focus on the quick approval of a new pipeline, new construction can take four or five years from the beginning of the approval process by the Federal Energy Regulatory Commission and state agencies to the time when gas flows to the region, even when these objections from local communities and environmentalists can be accommodated. This raises the specter that the proposed moratorium could last for years before the underlying conditions improve. Over the years of your service as Governor, you have time and again shown a unique ability to overcome obstacles to the major, critical infrastructure projects that New York relies upon for its economic wellbeing. Your leadership has helped surmount obstacles including outdated regulatory requirements, a lack of creativity in the engineering of a project, or an overreliance on conventional thinking when it comes to risk and financing. For the sake of our county’s economic well-being and the residents and communities that rely upon ongoing development projects put at risk by this sudden and potentially long-lasting natural gas moratorium, we ask you to provide that same leadership, ingenuity, and outside-the-box thinking to our current problem. We are prepared to do what we can to work with you in this effort. The inner wrestling with emotions that’s going on with Westchester folks is obvious. They want their freedom but they’ve come to love their captor, Andrew Cuomo. It’s the Stockholm Syndrome at work.